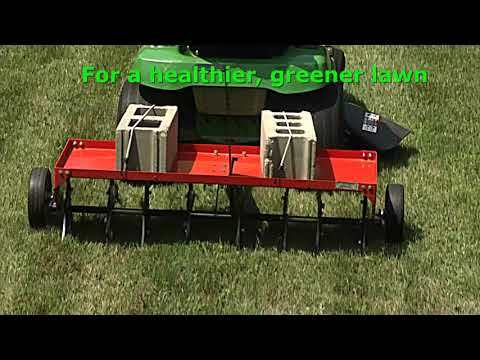 Make your lawn greener and healthier by stepping up to professional style aeration. Our 48" Plug Aerator pulls 3" plugs to break up compacted soil and develop a healthier, more robust root system. Usage - 32 galvanized knives to penetrate the soil easily. Durable - Flat free tires allow for smooth transport. Easy Transport - Transport handle for easy raising and lowering of the aerator knives. Shipping Dimensions 49.9" x 16.9" x 8"
This Aerator works great! I used it and over seeded my lawn and what a difference! Looking forward to using aerator , my lawn needs it , as soon as the axle comes in . Will be glad to do another review when I have been able to use it. Q.Are replacement knives available , if so how much are they . A.Hello, thank you for contacting us. The knives are available to be ordered if needed. They are sold individually, part number 41063, costing $5.99. They can not currently be ordered online, but directly through our call center. We can be reached at 1-800-687-6575.